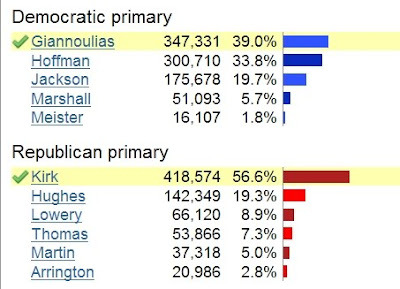 Here are the numbers for the U S Senate primary race. Giannoulias is connected to Tony Rezko and political loans through the bank his family owns. Some say Obama will stay away from Illinois to avoid the stench surrounding Blago. Besides, Rezko sold Obama the land next door. It's easy to get something on you when you do a photo op. If the GOP is smart, they'll hammer Alexi G on the Rezko link. Speaking of the GOP, Don Lowery is generally considered the Tea Party candidate in the race. Ms. Thomas claimed to be but never really got much support. Hughes didn't bother to vote for decades and became a republican in 2008. Not much to go on there. Mark Kirk is an enigma. He's active duty military and is probably the most knowledgeable congressman when it comes to Afghanistan. He's been there, and not on a junket. He also has taken a prominent stand against illegal aliens, though an analysis of his bills would reveal they are practically meaningless. Deporting gang members is a pretty safe position. That's the good news. On the other side he voted for Cap-and-Trade. That can't be good. He's also a member of an ad hoc group of centrist republicans in Congress called "Tuesday Club" or some such a thing. His district (IL 10th) is politically liberal and well-heeled. That might explain some of his left-leaning votes. But he keeps them happy, even when they vote for democrat presidential candidates. Like the other Kirk (Kirk Dillard) there isn't much hope of reconciliation between Mark Kirk and the Tea Party. The only silver lining is that Roland Burris will be gone.